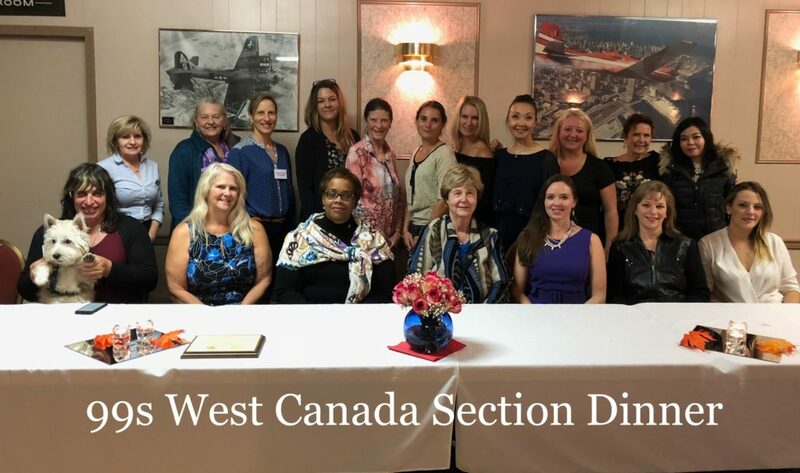 Thank you Cindy for sending this report on the West Coast Section’s AGM. The British Columbia Coast Chapter (BC Coast) hosted this year’s West Canada Section AGM in Abbotsford, BC. We had members from Canadian Rockies, Alberta Chapter and Special guest, International Treasurer Leslie Prellwitz from Chicago was also present. Evening of Sept 21st, a Wine & Cheese reception attended by members and their guest. Also invited were local supporters of the 99s. the West Canada Section AGM which promptly began at 9 am, lead by West Canada Governor Rosella Bjornson. The successful meeting was followed by a tour of a local winery. In the evening, a delicious organic, locally sourced dinner was prepared by our chapter’s 2018“Fly Now” award winner Madeline Ungurain, who is also a professional chef. The evening was capped off with a presentation by our Chapter member Angie Tanton titled “Flying for the UN”. Angie now is a pilot with Transport Canada patrolling our Pacific Oceans region.